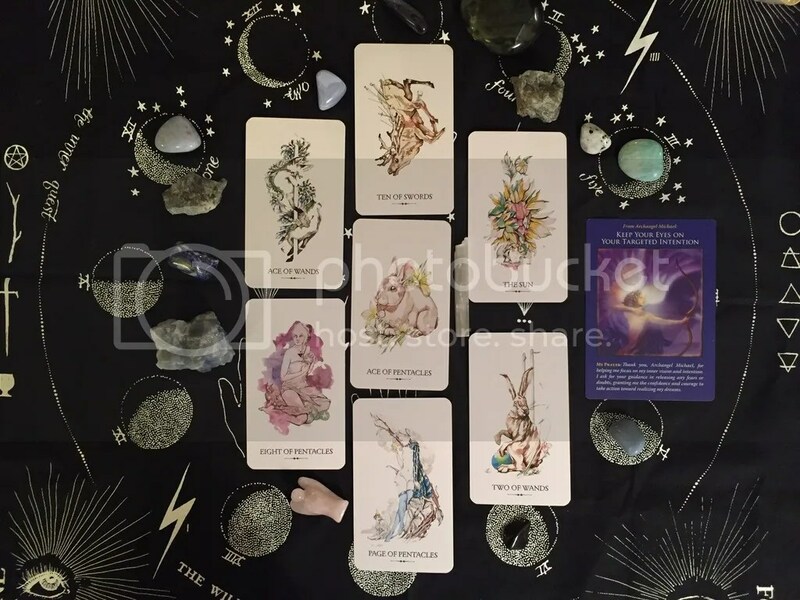 I didn’t take the usual photos of the cards individually because I had not planned on sharing such a personal reading, so the format is a little different. For this New Moon, I wanted to mix things up and I came across Ethony’s spread right on time! 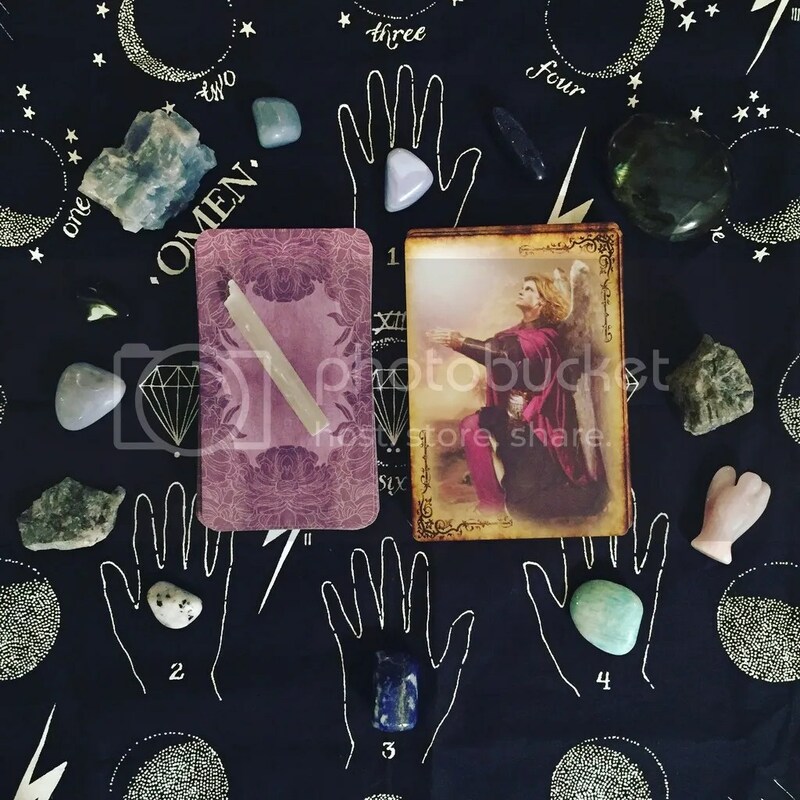 I have been experiencing some extreme feels concerning work and the direction of my career and I used this fiery New Moon to give me some clarity on what my next move should be. I chose the Ace of Pentacles as my “work-related” card because, in all honesty, I would really like a new job altogether. I’m not saying I’m ungrateful for the jobs that I have now, I just feel like I have completely outgrown one (I’ve been there for 9 years and there’s nowhere left to go), and I might be overqualified for the other but there’s a severe breakdown in communication there as well, which could be making me feel like I don’t belong. The first words I wrote down were “The end of a cycle”. After I went through with my first impressions, I went to the LWB for the Linestrider to read Siolo’s magic words. This stuck out to me loud and clear: “…remember that rock bottom is often the very place where we start our most triumphant climb!” So beautiful! When I did this reading, I was feeling very bottom-y. I didn’t really identify with “rock bottom” per sé but I felt like if the cycle I think this card was referencing wasn’t ending soon, I’d feel rock bottom pretty soon. I’ve felt rock bottom about my long-term job many, many times. Too many, if you ask me, and a lot of YOLO synchronicities have been coming into my life pretty frequently lately, which have served as a solemn reminder that we only have one life, why waste it on this or that. This card always looks so ominous but this time, it feels hopeful. I felt like those Swords were stabbing me deeply. A painful reminder of the care I need to take for myself and my own well-being. My first impression of this card was “Stop trying to figure out which thing to pick and just pick one already! !” I feel like there are a lot of things on my plate and this is telling me to trim the fat. What kinds of foundations am I trying to put down? Am I trying to stay in the place where I know I can’t move anywhere or advance in my career or should I be trying to pursue something else? The uncharted? Around Christmas time, I was telling my sister that I feel that it’s too late in my career to be doing certain things or going down a certain path and she gently (sternly) reminded me that it’s never too late for anything! She’s right. Maybe I’ve been going about things a certain way for too long because it has been safe. But where has safe gotten me so far? I feel like this card kind of mirrors the Ace of Pentacles, so it feels like a sort of call back to the “New job” theme of the reading. How can I bring these big dreams of mine into reality? What kinds of dreams do I even have? I can’t keep neglecting these dreams! What do my Heart and Soul really desire? I feel like I need to take that Two of Wands energy and figure it out so that I don’t neglect that. What sorts of dreams, ideas, and grand plans can I put into action?! More creative, passionate, fiery (hello Aries fire!!) energy! This is my Shia card. You know, “Do it!” This is definitely an extremely action-oriented card. I guess this goes along with my fear of the unknown (as reflected in the Two of Wands) and it’s asking me to embrace the what-ifs. I really love the foxes in the Linestrider. They’re so playful, energetic, and mischievous. Everything is so playful for the fox! And the fox in this card feels so full of playful potential. I definitely want to harness and have this wonderful energy as an ally for sure! Unknown, here I come…? Finally, I asked: What Archangel Michael card will help me get a new and better job in my best and highest good and in the best and highest good of all involved? I drew Keep Your Eyes On Your Targeted Intention from the Archangel Michael Oracle. In the words of the great philosopher Keanu Reeves, “Whoa“. I was looking up various New Moon manifesting rituals before I found this particular spread and one thing I wanted to do was get clear on my intention. Once I got that, I feel like that’s when the synchronicities came along: finding this spread, playing with the Linestrider and pulling the cards I did, and pulling this particular card. I drew all this before really writing down my intentions for this New Moon and I think it’s really powerful because this card is an intense one! After the Tarot made it very clear to me that my work situation needs to change, the fact that Archangel Michael agrees is extremely important! I made sure to put this card in my bedroom altar, next to Sanat Kumara, of course, to remind me of my intentions. If I could, I would put this whole reading there just to remind me of the path I want to take towards a more vibrant and better future but I took a minute to I draw it in my Bullet Journal so that I can have it with me where ever I go. Woo! This reading was quite personal but I felt like I needed to share it. I feel like my cards are like, “Listen, you’ve been going down the same path and it’s time for you to change it up!” Definitely. I need more positive change in my life and I’ve given myself a bit of a deadline to figure out my next move. That’s me protecting myself, which is understandable, but also trying to sort things out further as well. Especially with Venus still Retro and Mercury coming up Retro on April 9, I’m trying not to be too wild and free with my contracts but also trying to save my sanity as well! How was your New Moon? Did anything major come up for you?